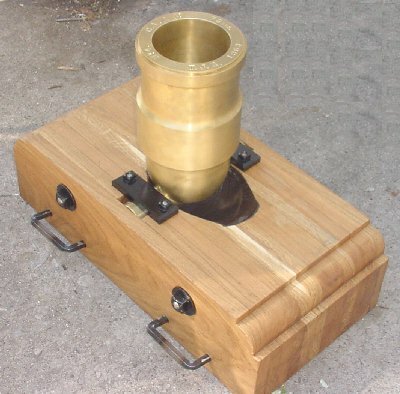 With the Brass Mortar Barrel completed, it was now time to build the Coehorn Mortar Bed. 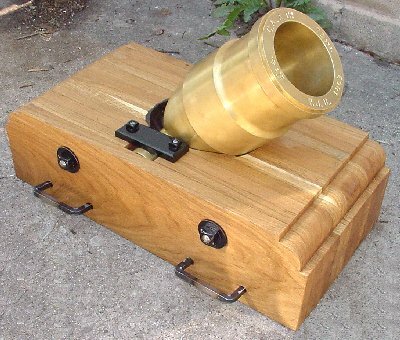 Most of the smaller Civil War Mortar had wooden platforms called Beds. These Beds had 4 carrying handles and held the mortar barrel at a fixed 45 degree elevation. 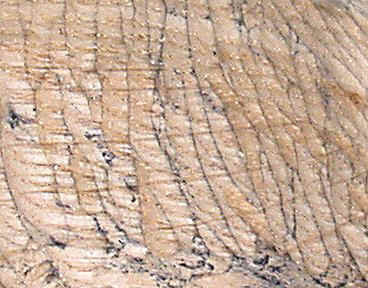 All wooden Mortar beds were made of white oak and were generally constructed of one large piece or two half-pieces glued together. 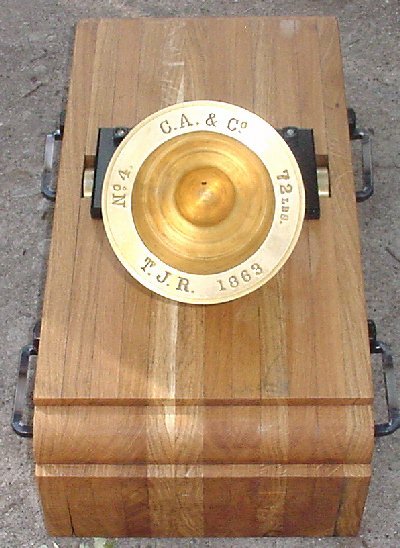 This Civil War Mortar bed will also be constructed of White Oak. 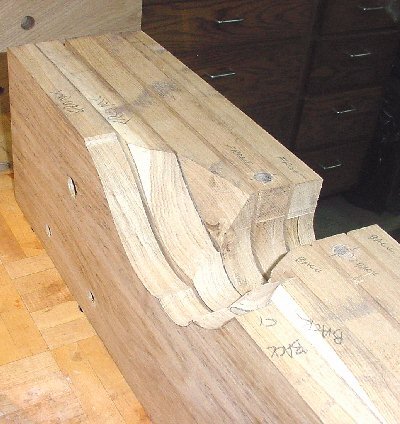 But in this case it will be constructed of 12 individual pieces, each 1" thick, glued together. 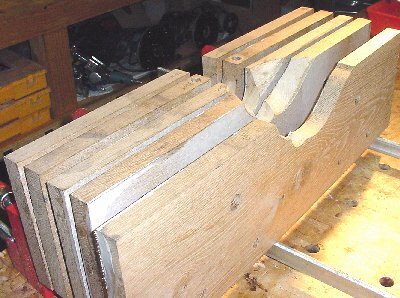 By making 12 "slices" it was easy to use a band saw rough profile them and then glue them together. 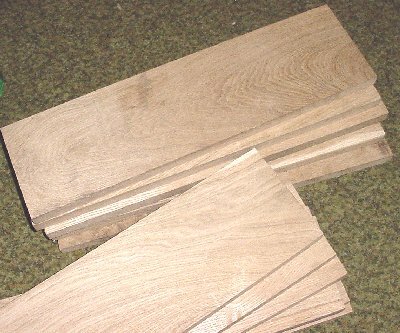 The White Oak was ordered from the saw mill cut to size; 12 pieces, 7" wide by 26" long by 1" thick. The first step was to square cut each board by trimming the ends making them all 24-5/8" long. With all 12 pieces identical at this point, the two best pieces were selected for the outsides of the Mortar Bed. 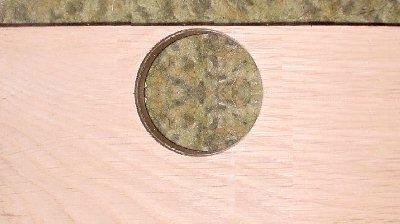 These two outside pieces were drilled per print and became the pattern boards for drilling the other 10 pieces. 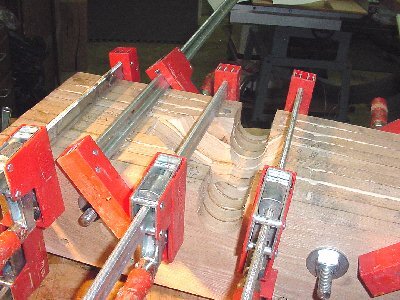 These outside pieces are the only ones which are not cut for the trunnion. 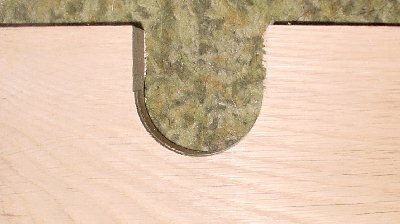 The next "in" 1 inch slice is identical to the outside board except that it has the trunnion cut-out and 2 vertical holes drilled each side of the cut-out. 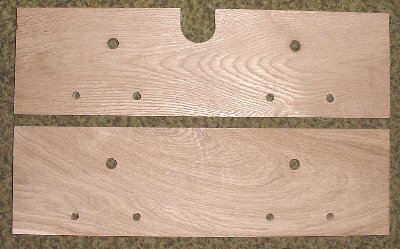 These vertical holes are for the "Cap Square" bolts. 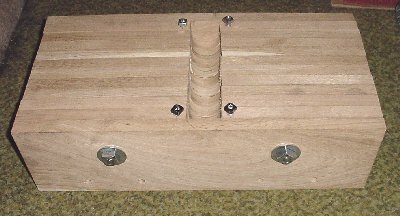 The Cap Squares are the two metal plates that bolt over the ends of the trunnions. 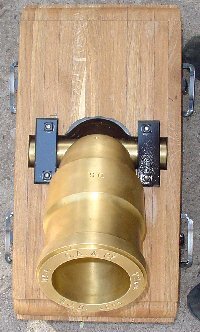 The Trunnion cut-outs were made by using an adjustable "fly-cutter" set to the 2-3/16" diameter of the trunnions. 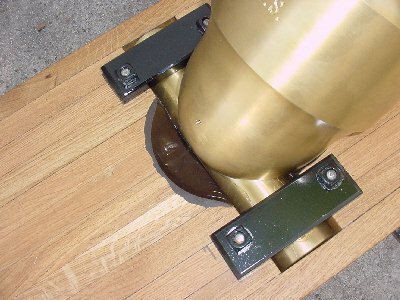 This hole was very close to the edge of the board and a band saw was used to cut it open at the top which formed the "drop-in" opening for the Mortar Barrel Trunnion. All 10 inner slices had this same trunnion slot. When all 12 pieces were placed along side one another, they started to show the rough shape and size of the Mortar Bed. Weight of the wood totaled just under 60 pounds. 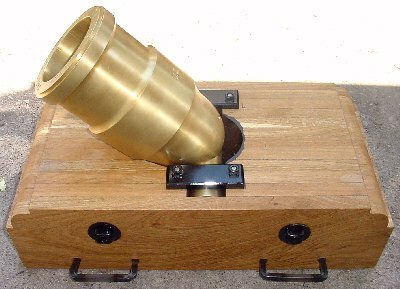 Hardware for the Coehorn Mortar is very simple. 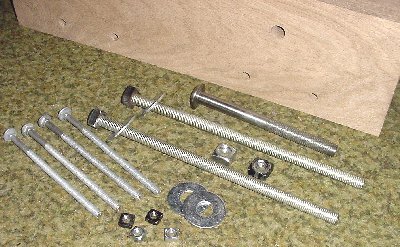 Two large cross bolts ( or threaded rod ) with large square nuts and washers at each end. Four Cap Square bolts ( which come up through the bottom of the Civil War Mortar Bed ) along with 4 corresponding square nuts. Two Cap Squares and a set of 4 handles. 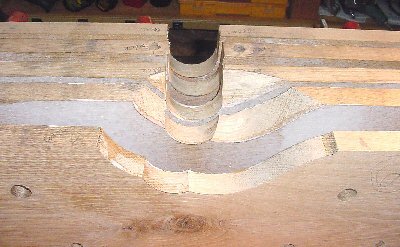 ( not shown ) The dozen slices of the Mortar Bed were bolted together to check hole alignment. 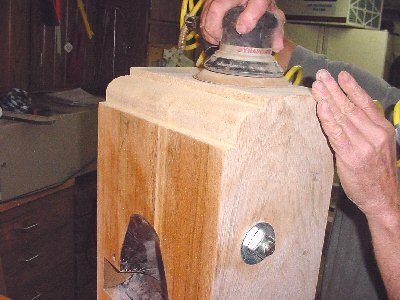 Next, a band saw was used to cut the profile shape of the Mortar's base into the center 6 boards. 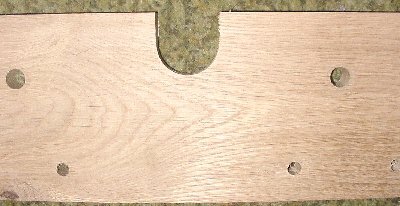 These 6 center boards were 3 pairs of right and left hand profiles. 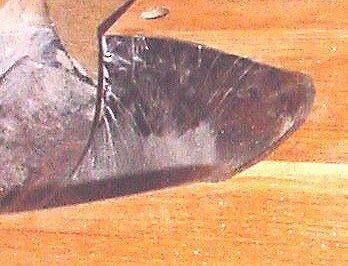 A disk sander was used to roughly bevel the edges to form the curved "pocket" for the Mortar base. 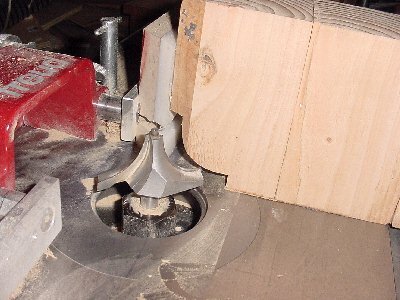 Next, the center 10 boards were glued and clamped together. The outside two boards without the trunnion cut-outs would be added later. 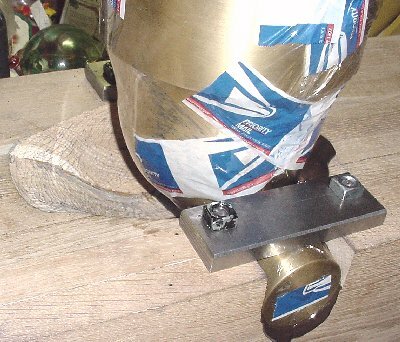 The rule of gluing and clamping is simple. 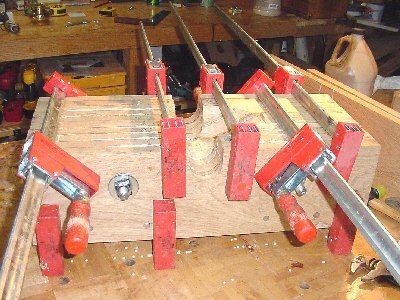 "You can never have too many clamps." 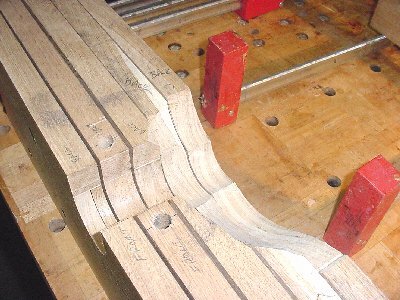 The bed cutout profile was contoured by hand using a small chisel. 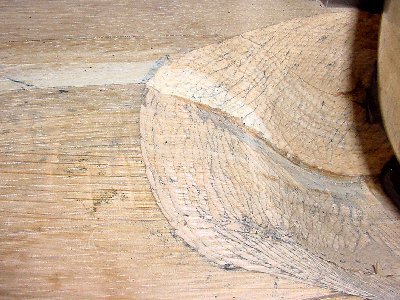 Carbon paper was placed on the wood surface and the barrel was lowered into the cutout against it. All the high contact points where the wood touched the brass would show up as small black lines. These contact points were chiseled away and the carbon paper process was repeated. After about 2 hours of carbon paper prints and chiseling, the surface contour of the bed matched the curved shape of the barrel. 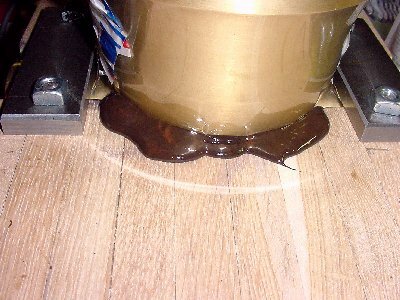 The epoxy totally hardens in about 4 hours and cures to full strength in 24 hours. It is important to remove the barrel "before" the epoxy totally hardens. 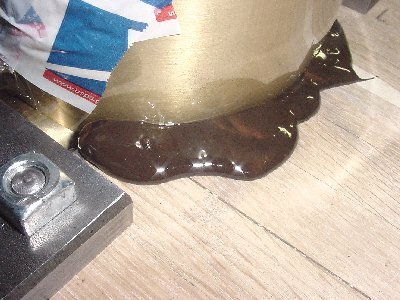 After about 3 hours, when the partially harden epoxy reaches the consistency of very dry chewing gum, remove the barrel. 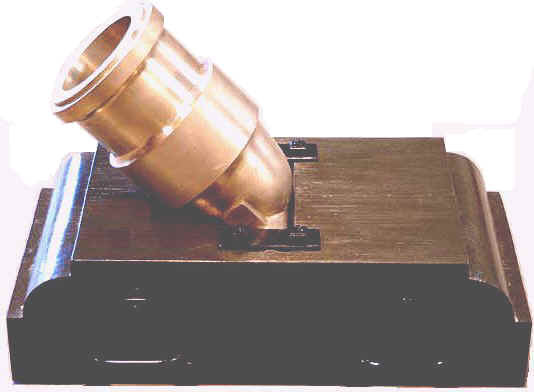 This way, if there is any problem with the bedding material wrapping around the top of the trunnion, the epoxy still has some flexibility and the barrel can forced free. The two remaining side boards were now glued onto the outsides of the bed. While they were drying, the shaper was setup and a test cut was made in preparation for the final top edge contour. All "Union" Coehorn Mortars had this distinctive top edge shape. 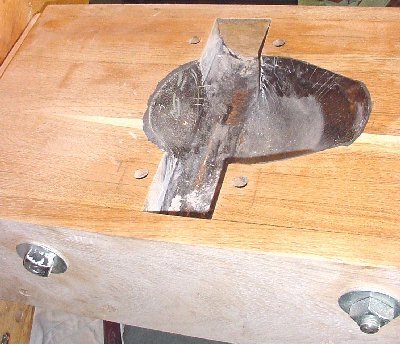 Most "Confederate" Civil War Mortars had simple 45-degree cut corners. Since we wanted a true Union look, we took the extra time and didn't "cut-corners", we shaped them. After the shaping operation, we sanded all the surfaces. Finally, the metal parts received a coat of Black enamel paint and the wood was thoroughly coated with boiled linseed oil. Lots of pictures show this to be almost like a piece of furniture.